The CES 2013 event is kicking off over in Las Vegas where we can expect to see a whole host of shiny new products destined for the tech world, which of course will include some new smartphones coming to the market in the next few months. In the last few weeks we have been hearing more about Chinese manufacturer Huawei, and it seems the Ascend D2 could be making an appearance at the event later today. 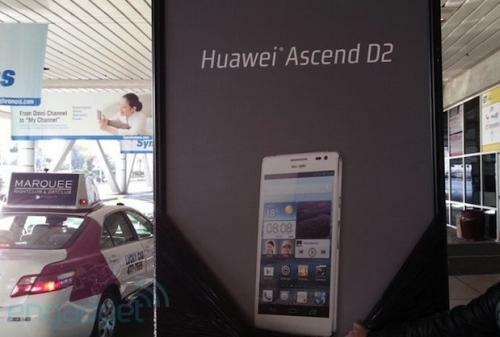 Back in December we heard rumours suggesting the Huawei Ascend D2 along with the Ascend W1 will be showcased at the 2013 CES event, and now as Engadget are reporting a new billboard has been spotted that is getting ready for the event in Las Vegas, Nevada. This all but confirms the device will make its debut at the show and the company’s press conference is set for 1pm EST today. So far rumours for the device have suggested a smartphone featuring a 5-inch 1080p display with 1920 x 1080 resolution, which is thought to be powered by the company’s own K3V2 quad core processor clocked at 1.5GHz. Other features are thought to include a thirteen megapixel rear shooter on a device running the Android 4.1 Jelly Bean operating system, with the juice provided by an impressive 3,000 mAh battery pack. There is still a lot of information missing from these rumours such as the installed RAM and internal storage, but the handset will supposedly measure 140mm x 71mm x 9.9mm and weighing in at only 170grams. The company’s offerings haven’t really captured the public’s imagination so far outside of Asia, but this looks set to change this year with some notable products in the pipeline. This includes the rumoured Samsung Galaxy Note 2 rival the Ascend Mate, which is thought to feature a massive 6.1-inch Full HD display providing 361ppi pixel density. Under the hood is supposed to be the quad core HiSilicon K3V3 processor clocked at an impressive 1.8GHz and all packaged into a form factor measuring only 9.9mm thick with a 4,000 mAh battery unit. While all of this is only rumours and speculation so far we will hopefully have more information later confirming any specifications along with the all important pricing and availability for the company’s new handsets. Will you be considering a new smartphone from Huawei this year?